European saloon car racing went through a bit of a revolution during the early Sixties. The big-capacity classes were usually dominated by the 3.8-litre Jaguar Mk.2. But in 1961 the British Saloon Car Championship adopted the FIA’s Group 2 rules (as did the European championship when it formed in 1963), which allowed cars with engines over 4000cc to compete. That opened the door to Yank tank V8s. Ford led this new wave of American muscle. That wave came in the unlikely form of the gargantuan, 17-and-a-bit-foot long Galaxie. These 7-litre behemoths were obviously immensely fast, but getting them to handle properly was a big challenge, but with the likes of John Wilment and Alan Mann working on the problem it was soon solved. It turned out the fairly simple answer was to use two shock absorbers on each wheel. With such drivers as Jack Sears, Graham Hill and Roy Salvadori at the wheel, the Galaxie regularly battled at the front of the field. Images of it going wheel-to-wheel with Minis that would more or less fit in its boot became iconic. 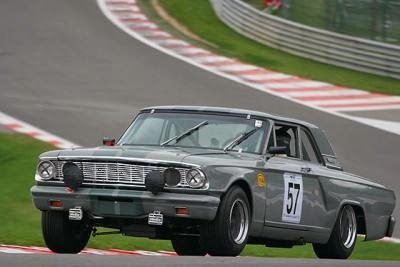 The Galaxie’s star burned brightly but briefly before it was outclassed by the much more nimble Lotus Cortina. Still, its baton was picked up by the Falcon later in the decade, Frank Gardner taking the championship in ‘67. So what, you’re probably asking, does all this have to do with the Ford Fairlane featured here? I mean, the Fairlane never raced in period. Except it did, or rather one did. The Fairlane was the mid-size offering in Ford’s Sixties saloon car line-up (despite being over 16 feet long). In 1964, Ford’s go-to racing team Holman & Moody built a Fairlane to run at Daytona, using many of the same tricks that were developed on the Galaxie. As such it had a 427ci V8 with twin Holley carburettors, two shocks per wheel and 5-linked rear. It also had mostly fibreglass body panels, a 4-speed Jerico manual gearbox, 10-inch wide wheels, 12-inch front disc brakes… Unlike the European-spec Galaxies, the Fairlane clearly wasn’t running in a production-based class - it shared very little with the showroom model. Unfortunately, the original was lost in the early Seventies when it was broken up by Alan Mann. However, during 2002-2003, it was recreated by Holman & Moody to the exact original specifications. It therefore comes under the FIA’s Appendix K regulations, the catch-all category for cars running in period-correct spec. The fact this Fairlane has Appendix K papers is absolutely key, because they make it eligible for the vast majority of historic racing’s blue riband events. It already has some impressive results to its credit: 2nd overall in the 2006 Spa 6 Hours; 1st overall in the 2010 Oldtimer Grand Prix Marathon on the Nurburgring Nordschleilfe and other significant class wins. It would probably need a bit of development to keep up with the frontrunners these days - it’d be hopelessly outclassed by the GT40’s in the Spa 6 Hours. And it definitely ain’t cheap - you could probably build the best Galaxie in the world for less. But it’s something unique that will get you noticed on the track. And it’s hard to put a price on that.